Size: 4.9" x 4.2" x 1.0"
This TI-7350 is a rather interesting calculator in the otherwise boring TI-1795 calculator line started already in 1984. It was introduced in 1996 and manufactured in China with the latest chip-on-board (COB) technology, but still uses the more rectangular housing of the TI-1795+ introduced in 1992. Dismantling this TI-7350 reveals not only the above mentioned COB-technology but even the TI-1795SV designation, a product name we encountered in the year 2000. 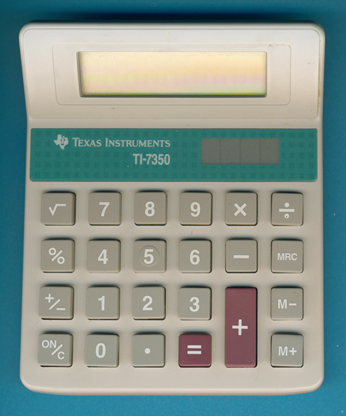 The calculator was replaced in 1998 with the TI-7350SV sporting a completely different housing. © Joerg Woerner, March 4, 2011. No reprints without written permission.